Even your shady area can show off your Canadian pride when you light them up with the glorious colours of red and white! 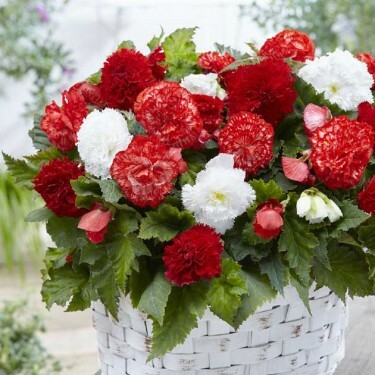 Bring a bit of spice to your garden with these Fimbriata (fringed) Belgium Begonias. Whether used as a contrasting colour in a mixed basket arrangement or planted alone in a patio display the softness of its full double blooms makes for a delightful show. To get a jump start on the growing season we recommend starting your tubers indoors for about 4 to 6 weeks. Remember, though, that Begonias are not winter hardy and cannot tolerate exposure to frost. In the fall, before the first sign of frost, dig up your tubers and place them in a loose bag of dry peat or vermiculite. Store them in a cool, dry place until replanting in the spring. Now larger sized bulbs!